Here are a few pictures of the first flower from one of the Clematis otophora plants in my collection (plants were obtained from Far Reaches Farm). 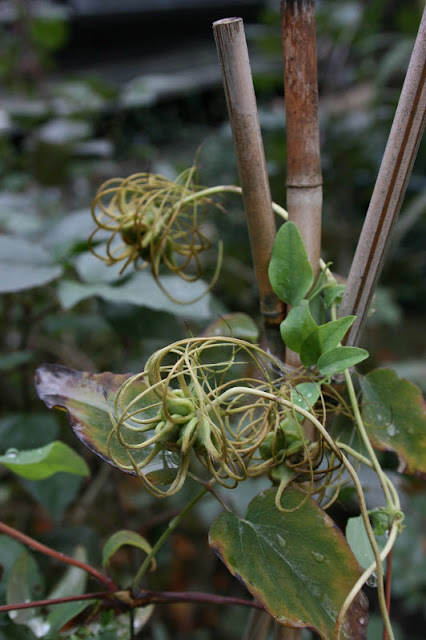 I purchased this plant because I was interested in using it to make hybrids with Clematis texensis. I have already been able to do this as I currently have both species flowering. Here are some pictures. More pictures of C. otophora yet to come. Here are some photos of C. texensis still flowering in my garden now. These remarkable and richly colored flowers have been produced sporadically since May.